Washington senior guard Matisse Thybulle has put himself in the conversation for the national defensive player of the year award. TEMPE, Ariz. – Matisse Thybulle or Zion Williamson? In the past few games, the Washington senior guard has put himself in the conversation with the Duke star freshman for the national defensive player of the year award. Thybulle is averaging six steals over the past four games, including a virtuoso performance Thursday at Arizona when he registered five steals, five blocks while also finishing with 15 points, three three-pointers, two rebounds and two assists. Thybulle, who won the Pac-12 Defensive Player of the Year award last year, is starting to build a national resume. Thybulle, who ranks third nationally with 3.23 steals per game and is tied for 30th with a 2.09 blocks average, is virtually a shoo-in to win a second straight defensive conference player of the year award. However, the UW senior is making a push for bigger awards with five weeks remaining in the regular season. “I think he’s the national player of the year and I don’t think it’s close,” Hopkins said. “We’re doing research right now looking back at the last 20 years of the top defensive player of the years in the Power 5 conferences and go look and see at what their takeaways are. 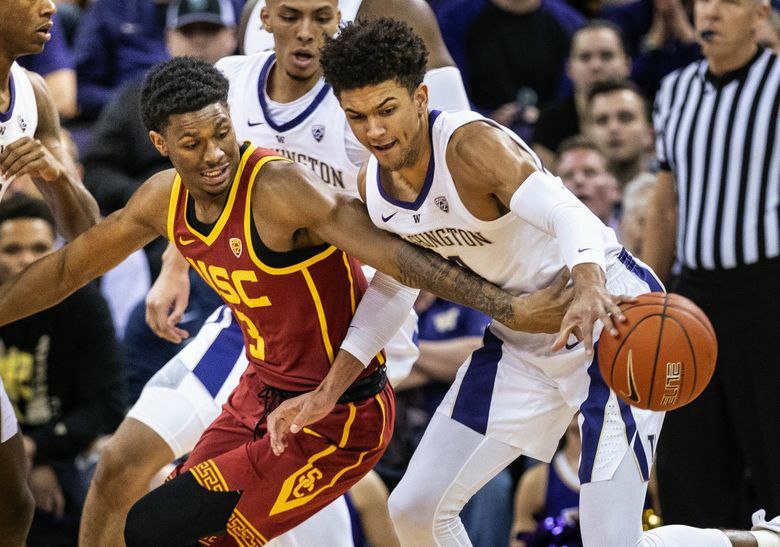 Heading into Saturday’s 7 p.m. game at Arizona State (15-7, 6-4 Pac-12), Washington (19-4, 10-0) has the top defense in the Pac-12 in large part due to Thybulle. In conference games, the Huskies have allowed 60.8 points per game and just 28.5 percent shooting on three-pointers – both league lows. Washington, which has won 12 straight games, has also forced a conference-best 17.1 turnovers per game. Crisp, who played at Rainier Beach High, spent two years battling against Thybulle, an Eastside Catholic product, in high school so he knows what UW opponents feel when they have to combat the 6-foot-5 guard with the 7-foot wingspan. And yet, Crisp is continually amazed when Thybulle is able to dominate games like he did Thursday at Arizona. Thybulle, who averages 10.0 points, went through scoring droughts early in the season, but he’s tallying 14.3 points in the past four games.